Yep, I blinked and March was gone. 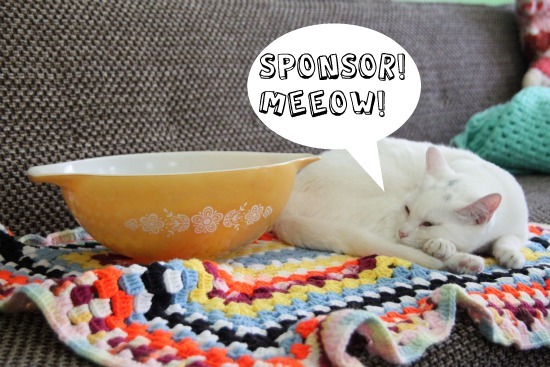 It's already time to let you know I'm accepting sponsors for the month of April! I love helping my sponsors increase traffic and find new ways to market their websites, and I'd love to help you too! Simply e-mail me if you're interested. You can check out my advertising page for more information. By The Way: Don't have a advertising banner? Don't worry, I'll make you one! 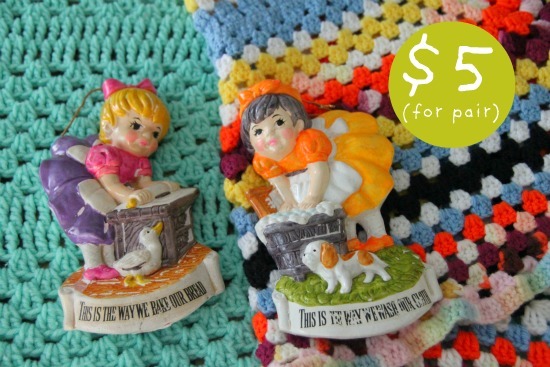 Thrift Store prices continue to rise. 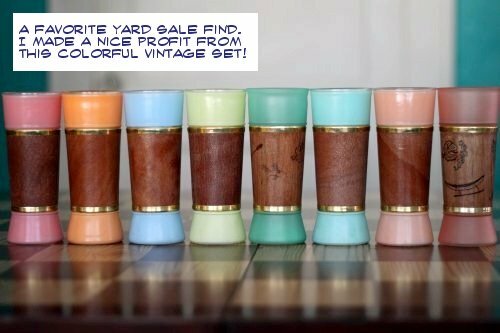 We want the best vintage at the lowest prices, I've written about flea markets, but another favorite alternative is going to yard sales. 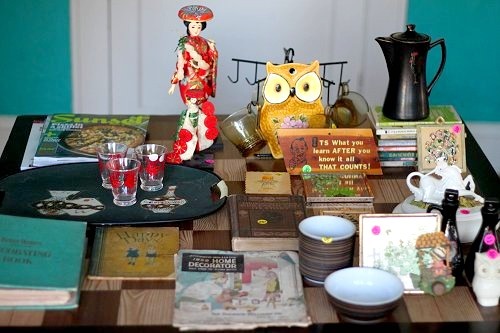 Every item pictured above is from garage sales in my neighborhood! Spring is here, so let's get hunting! I live in a Historic part of town and encounter vintage in neighborhood yard sales often. 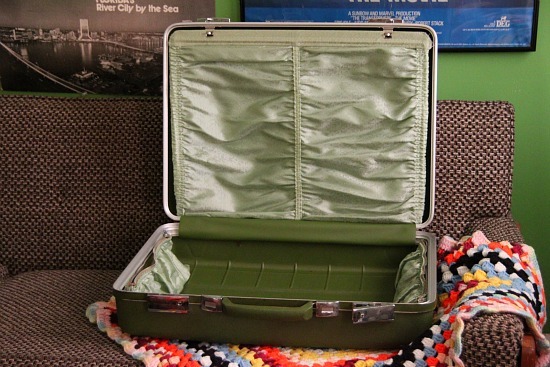 Best thing: it’s higher quality and cleaner than flea market finds because it came straight out of the house. This should go without saying. 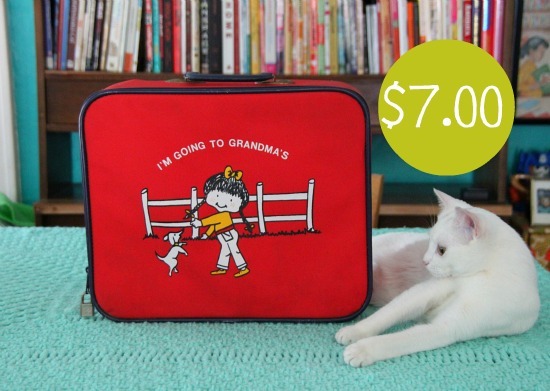 Older people means the potential for sales featuring the old goodies we love. 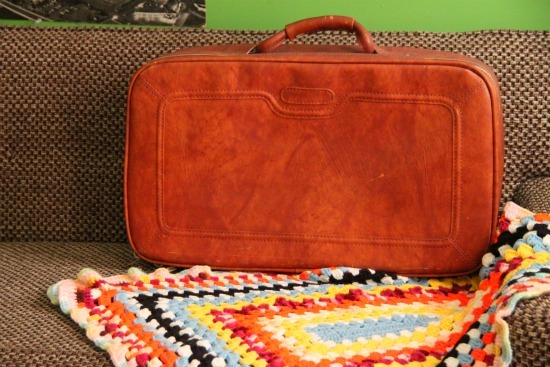 If a seller has a lot of vintage out at the sale, they probably have even more they’re willing to part with somewhere in their house. 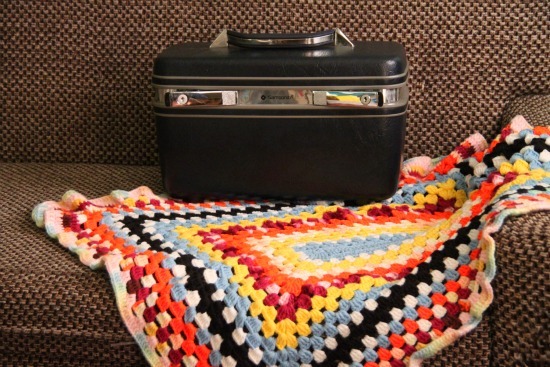 Let the garage sale vendor know you buy vintage and exchange information with them. This is one of the best ways to yield lots of quality vintage! 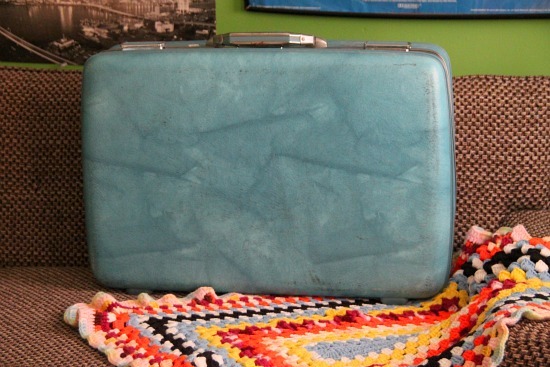 You can hunt for yard sales that carry the exact vintage items you desire! On the PC I like Yard Sale Treasure Map. For iphones and Droids I like the Mogasa Garage Sale Treasure Hunter. The AP is completely free and downloadable for androids and iPhones, click the links if you'd like to try them out on your phone. The AP has over 47,000 National garage sale listings, allows you to create a map so you can drive from sale to sale with ease. I like the Indiana Jones vintage treasure hunter design, too! 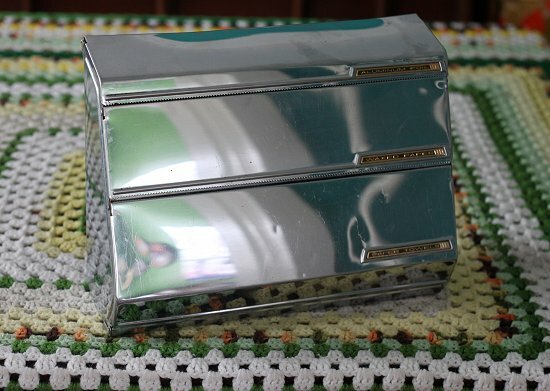 Mogasa/Penny Saver USA also has Garage Sale Classifieds (go here to post an ad) for you to peruse. 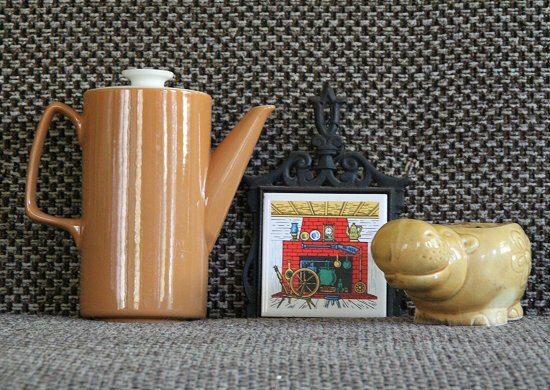 I use garage sale hunting tools because I can type in keywords like "estate sales", "vintage", "mod", "antiques" and "mid century modern", to find the antiques I crave. Ask for group deals and discounts. It never hurts to ask! Most people are in it to get rid of old junk and not make a profit, they love it when people ask to take more off their hands. 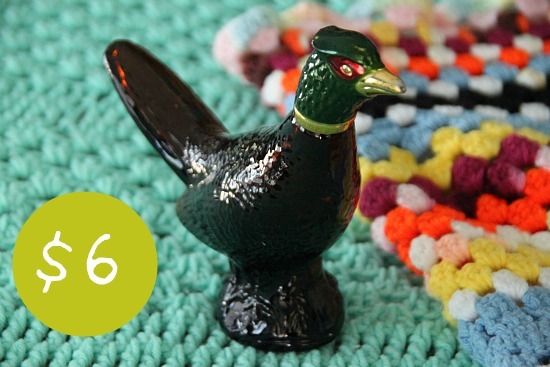 Question: What tools, tricks, and tips do you use when it comes to garage sale hunting! 'Tis the season. 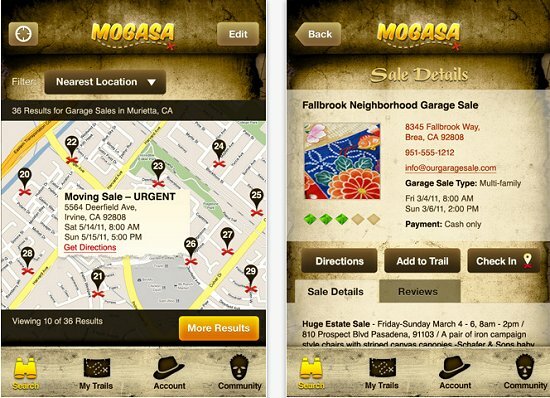 Disclosure: The Mogasa Garage Sale iPhone/android ap is a sponsor. Contact me if you'd like to be a Thrift Core Sponsor. 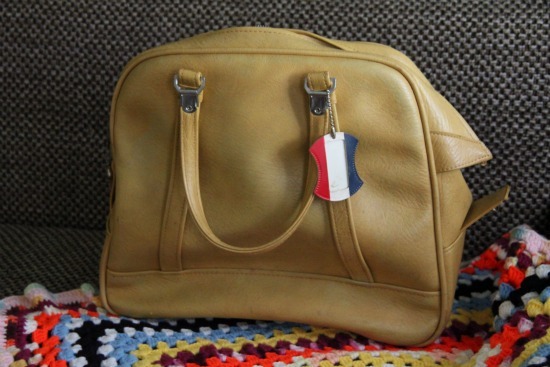 Last time we discussed Things We Can Never Resist Buying at Thrift Stores I left a few out. Stopping at 5 core things? Ha! Impossible. 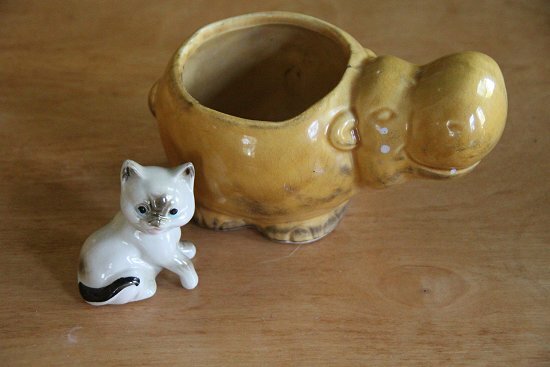 Here are five more things I love to snag while thrifting...for better or worse. Jars don't sell very well for me...but I love them so! 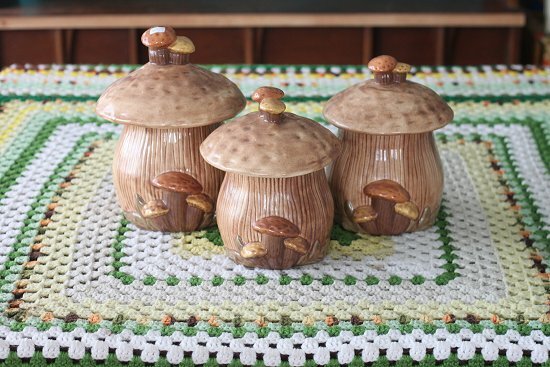 It's hard for me to resist scooping up sets of vintage jars. The set above finally sold this weekend, so there's hope yet! 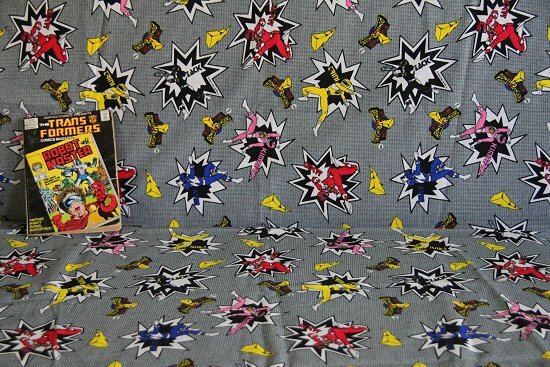 I love the bright, saturated primaries of made-for-kids decor, comic books, and other goodies. Everything I make seems to reflect this asthetic. I'm always seeking all things pop culture in general. Posters, card games, comics, anything. The Knuckles above was sadly stolen from my garden. 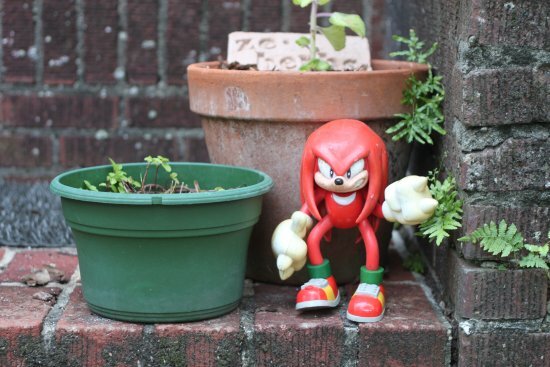 I'm half-tempted to make some "Missing Knuckles" posters out of that photo! I'll design it to look like the Missing Kids ads on milk cartons! My cup and barware fetish knows no bounds. I absolutely love buying and selling it. I could actually open a shop or two focusing on just cups and barware and feel creatively satisfied with that. The groovier or Jetsons modern sleek the better. I just love kitchen junk. I love too much junk, someone stop the madness. 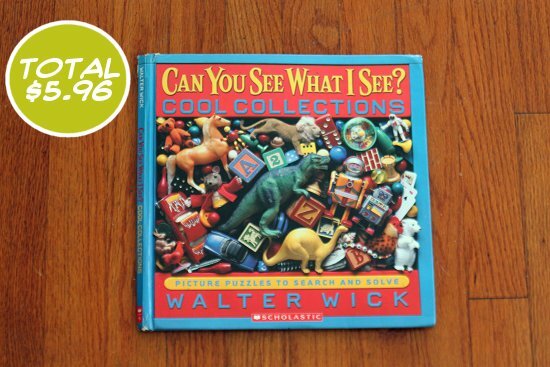 This past week I've introduced Thrift Core Daily Deals. 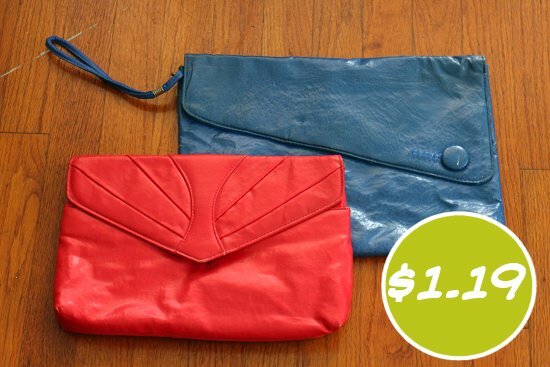 A couple of times a day I share amaze-ballz cheap deals on my best vintage items on my Facebook and Twitter. That's been working out really well, so I'm extending it to my Thrift Hauls as well! Check if out, and if anything catches your eye simply e-mail me to purchase it. :) The prices listed here are the prices I'm selling them for! Yep, good deals! 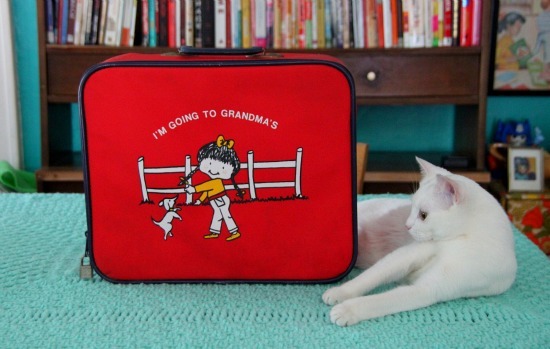 First up- I always love these adorable Going to Grandma's suitcases. 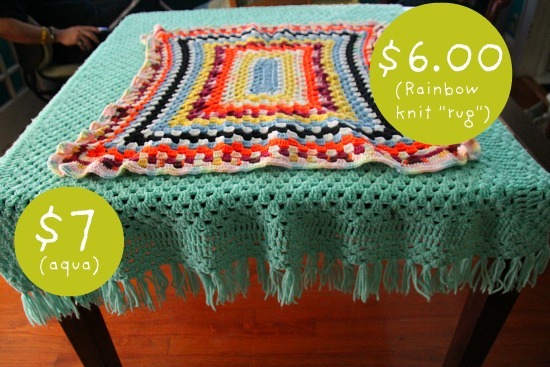 This one is available for $7.00! This is my favorite find of the week! 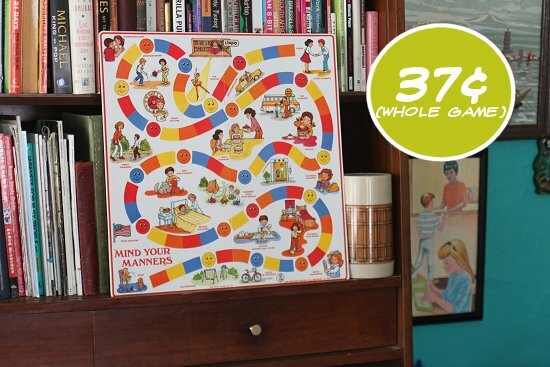 I've never seen a cuter vintage oil paint paint-by-numbers. 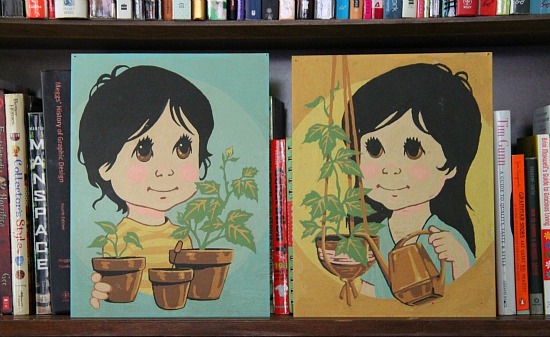 I paid more than I'd have liked for it, but the theme with the house plants, flat yet bold color, and big eyes really sold me. And yet more cuteness- I love the stars on this sweet little vintage pitcher. 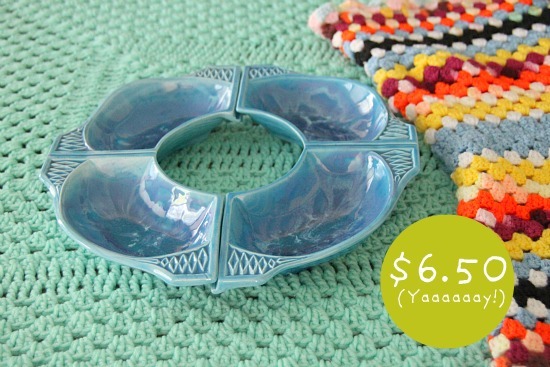 You're getting an Amaze-ballz deal on this one! These usually turn around quick for me. I love brass lamps like this for task lighting- they light up my antique mall booths nicely, too. 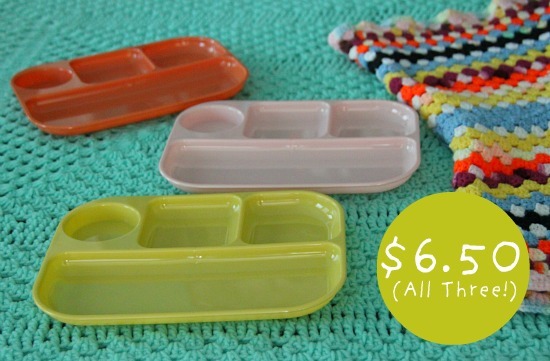 These trays would be perfect for organizing craft, art, and office supplies...or just eating from them as intended. :) I love the bright colors. This masculine bird decanter was once filled with Avon "oland" after shave. The bottle interior still smells yummy. 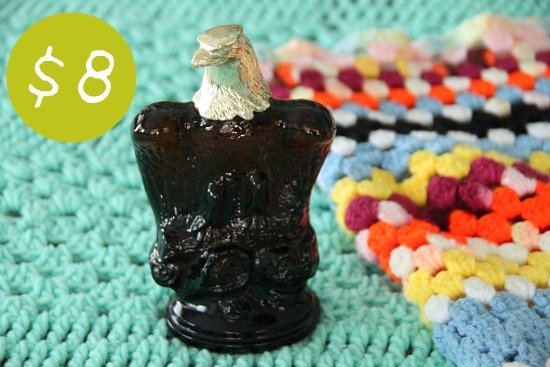 This Eagle decanter of the same line is stilled filled (all 5 fluid ounces!) to the brim with "Windjammer" after shave. Smells good; quite a lot like old spice. I love this pair of mod plates, made in Japan. The line design and color palate is so snazzy. So sunny! The pitcher is marked "Inarco E4279" underneath. There's a few chips, but I thought I'd try this pair out anyway. I should stop buying anything with any kind of chip, but some buyers like it. 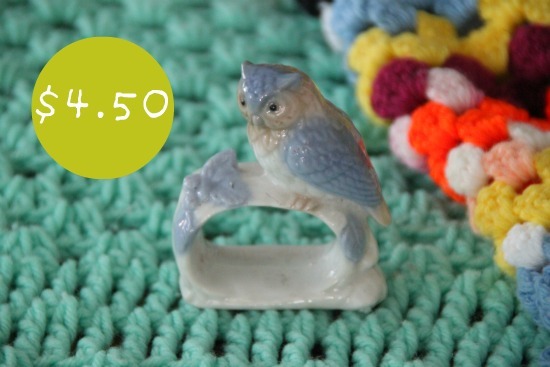 I like the colors of the tiny owl on this little napkin ring. I'm tempted to use it in some kind of potted still life. There's lots of age on this pair, but I love the super bright colors. The patina adds to the charm. 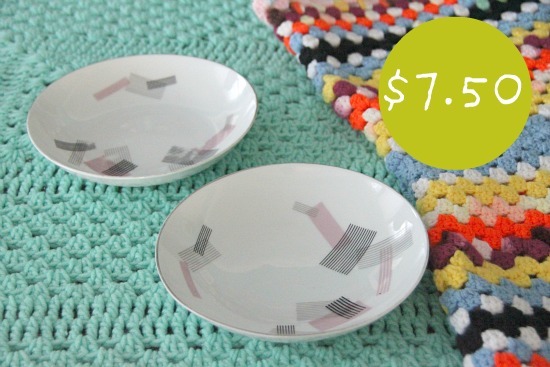 The picnic-perfect weather here in Florida has been inspiring me to pick up throws lately. The brighter the colors, the better! I love them for spicing up the backgrounds of photos, too. Yesterday I went on a day-trip South to Gainesville, Florida to explore Florida's only Geological Park, visit a friend, and check out a couple of museums. Of course I had to stop in at least one thrift store (pictured above, converted motel. It was amazing! Story soon) along the way! 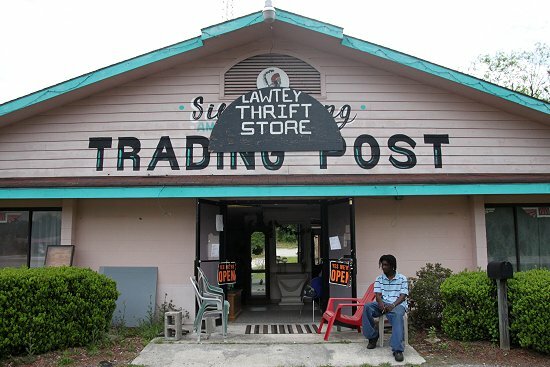 There are so many unique thrift and antique stores along Highway 301- but really...Florida is a picker's paradise. 1. Finally install Windows 7 on my computer and back up all files. 2. 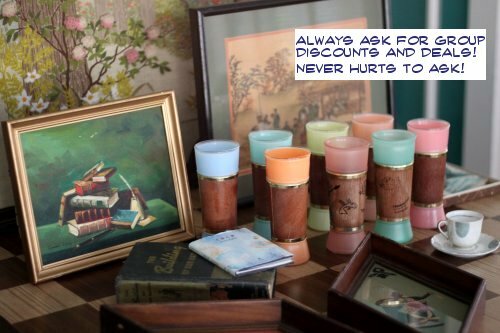 Make habit of listing all thrifted finds on Craigslist this week. 3. List all the items I set aside to get rid of last week on Craigslist. 4. Restage the antique store booths completely. 5. Make precise action steps and plans for increasing sales. 1. Install Windows 7 and Back up all files- no excuses. Do eeet. 2. List all the itmes I set aside to get rid of on Craigslist. 3. Mop, Sweep, Dust, and Scrub the house! Clean, clean! 4. 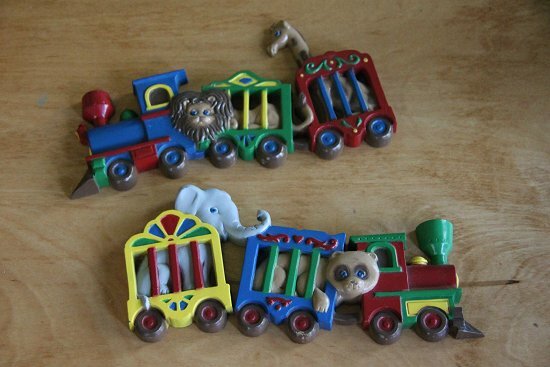 List everything in the house on Etsy/Craigslist- move it! 5. Get back to working on a different task every hour all day to stay productive. 6. Prep for the big group yard sale in front of Treasure House this Saturday. So Wucha Up To Next Week? Let's hit it! As #5 suggests, one thing that really helps me hit my goals is to write an exact schedule of action steps for the week. Each hour of the day I accomplish one important task for hitting my goals. It's hard to maintain, but it really helps you kick The Lazy to the curb. 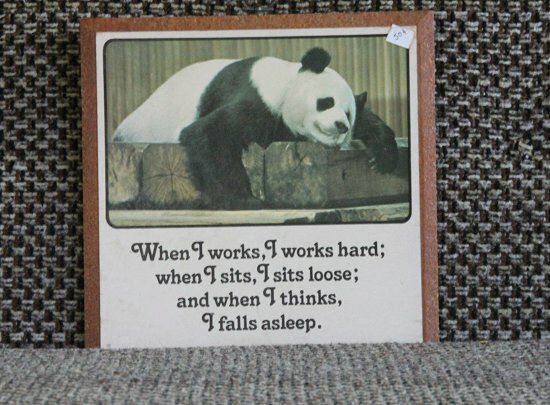 I'm never "lazy" but I always strive to be more productive and efficient. What have you got planned for the week? Let's share and keep each other on-track! As always, I've got many thrifted goodies to show off tomorrow! I'm always making my house a mess! 'Tis the life of a busy artist and reseller! I've mastered Speed Cleaning! Nothing’s better for waking up from a long winter hibernation than organizing your home to let the light in (even bears do it; we’ve checked). Today I’m sharing three easy spring cleaning tips I’ve found helpful for making my home feel fresh and organized. The best part? You don’t need to buy anything. We’ll work with what you already have in your home. b. 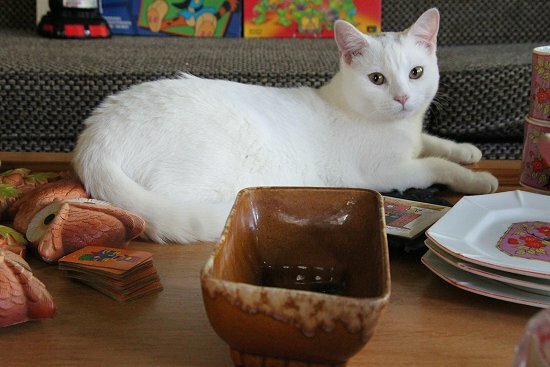 Create a trash, keep and garage sale pile– separate accordingly. c. Create a storage system for the keeps. d. Unload your sell pile by placing a free garage sale ad on PennySaverUSA.com or check out our mobile garage sale app MOGASA. 2. Get rid of unwanted furnishings- We all have them, a table or chair we’ve held onto for sentimental reasons, but in all honesty, don’t serve a purpose in our home. 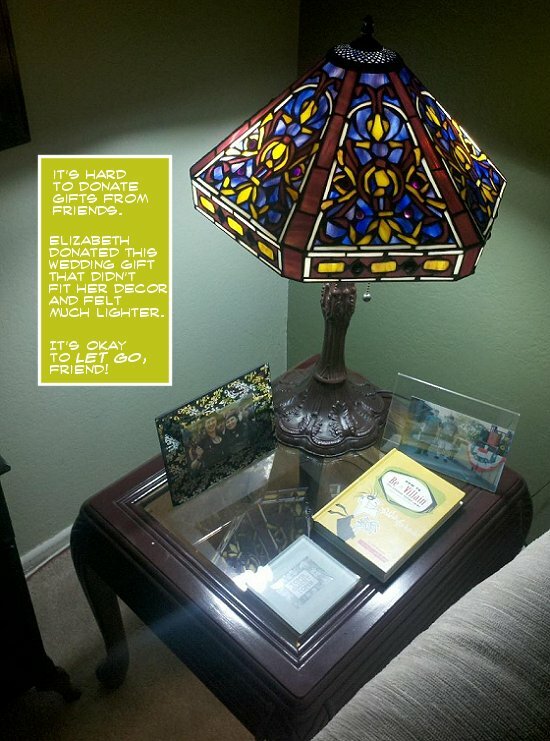 My husband and I received an adorable tiffany-style lamp for our wedding, but it didn’t fit anywhere in our home. When I finally decided to give it to a friend, I felt like a weight had been lifted off my shoulders. If you don’t have a buddy to donate to, create a free ad on PennySaverUSA to find a buyer who will love it. 3. Rearrange your furniture – Walking into the same room year after year is boring. Try moving the couch onto a different wall, create a reading nook, or swap accent pieces from different rooms. 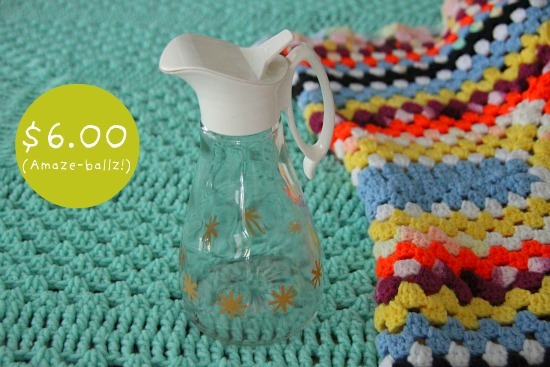 It only takes a few simple changes to give your room an entirely new look. 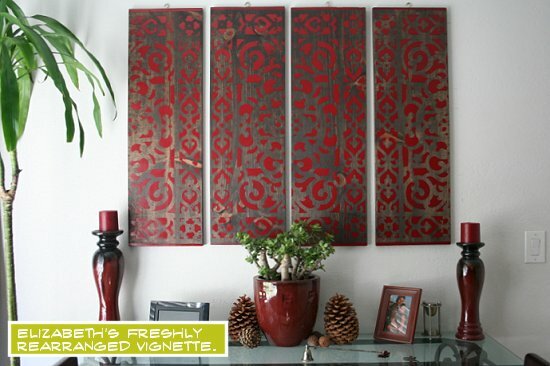 If you really want to go crazy, grab a can of paint and create an accent wall. 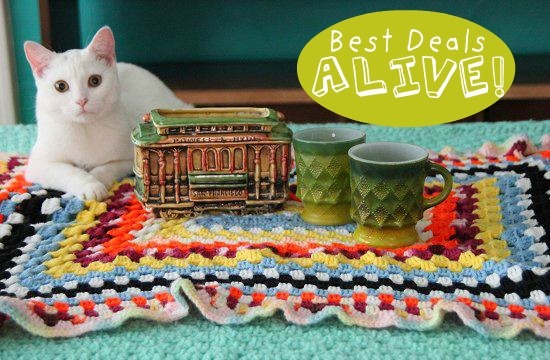 I hope you’ll have as much fun as I am reworking your living space. Mine is still a work in progress, but I’ve accomplished a lot as you can see from the photo. For more spring cleaning ideas, join us on PennySaverUSA, where we’re sharing spring cleaning tips all month long. What are you doing to Spring Clean your pad this year? Do share, I need all the help I can get! I can't wait to host another yard sale and purge, purge, purge! PennySaverUSA is a Thrift Core sponsor. contact me if you're interested in advertising on Thrift Core! First, gather your ingredients. You can use a vanilla bean instead of vanilla extract, it will give your milk that extra kick of delicious vanilla flavor. You can use any and as much sweetener as you like. I like to use two packets of stevia, a healthy plant-derived zero calorie sweetener that doesn't affect blood sugar levels. 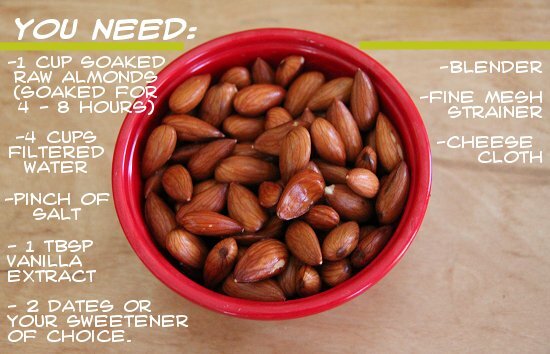 I like to soak my almonds overnight before I blend them up. 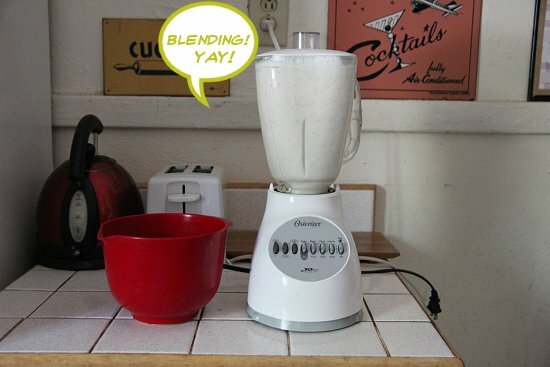 Blend together all of your ingredients. Once done, pour the mixture through your fine mesh strainer. This will separate the blended "milk" from the remaining pulp. The messiest part of this process is squeezing the milk out of the remaining pulp. 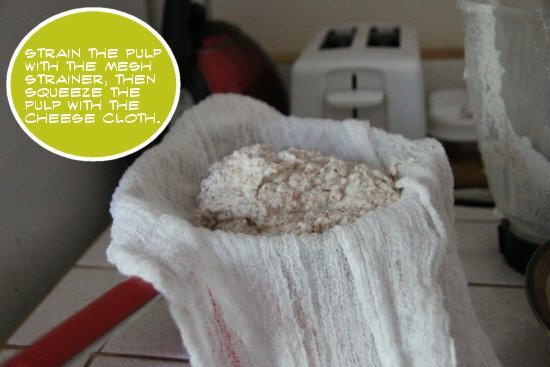 Pour the pulp into your cheese cloth and squeeze and squeeze until the pulp is bone dry. I save the dry pulp in the fridge for future recipes. Behold the product of your labors, a delicious pitcher of sweet, creamy almond milk for your munching needs. 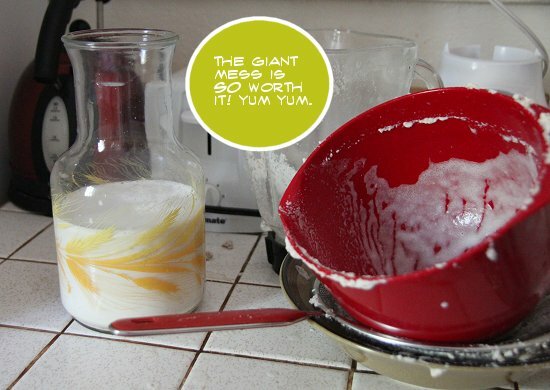 I'd stopped buying milk a while back when I abandoned my cereal-for-every-meal days and love this alternative! Good luck! 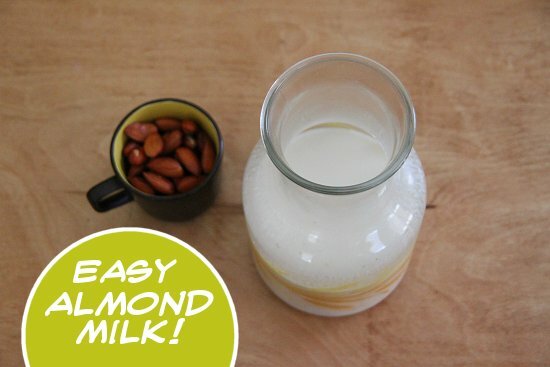 Do you make or buy fun milk alternatives? Any other thrifty, easy recipes to share? 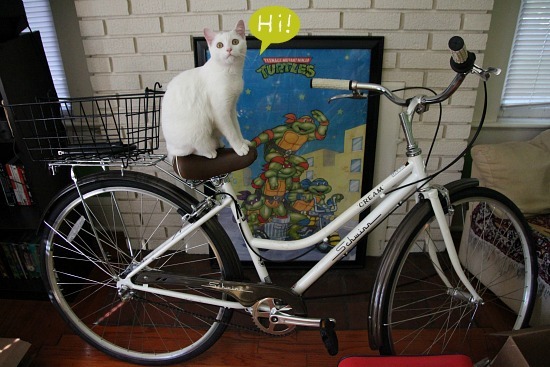 We've had chats about how thrift store prices are too high. I hunt at flea markets, and I've been spoiled by the pocket-change prices. For the majority of the year the most I spent on a second-hand item was $6.99 for a vintage car bike rack and even that felt outrageous. 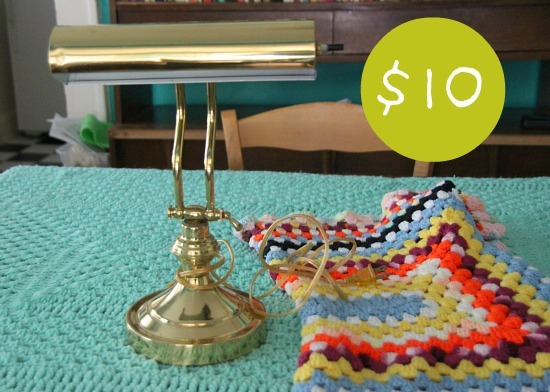 Pros: - You can't beat the prices on light items. - My friend bought 28 paperbacks and 14 hardcovers for $7.22! 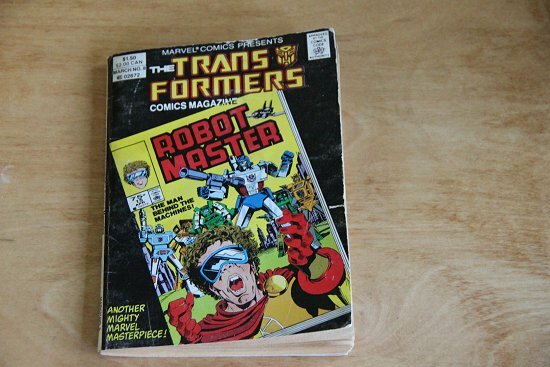 - Once I left with a tidy stack of books for $5 and resold some immediately at a book store to earn back my investment. Cons: - They've hired security guards to control the fighting! - Items get broken while people aggressively hunt. - Employees bought items out in huge carts; you dig for deals! - When a new cart is bought out you cannot explore it until security gives the word, then hunters pounce it in unison! - Heavy items will cost more and must be avoided. Hunting in a Goodwill Pound Store/Goodwill Outlet Store is a unique experience that makes you feel like a real Vintage Vulture! It's a cute vintage hunter term of endearment Dabito (Old Brand New) uses. 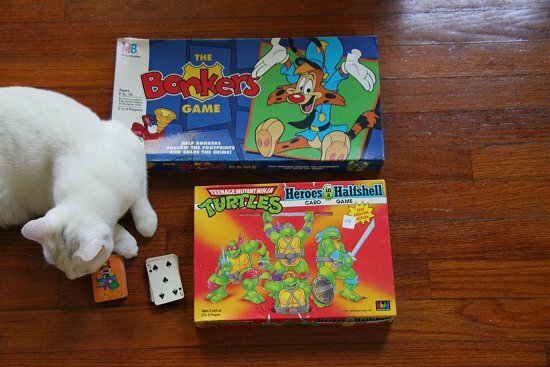 Have you ever shopped at a Goodwill Pound Store? What's your source for low-priced thrift finds? 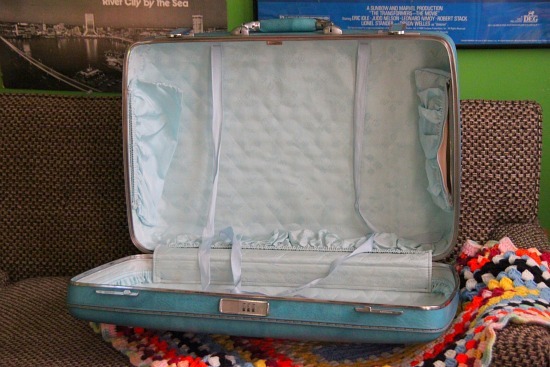 I found lots of big American Tourister suitcases this week, how appropriate! 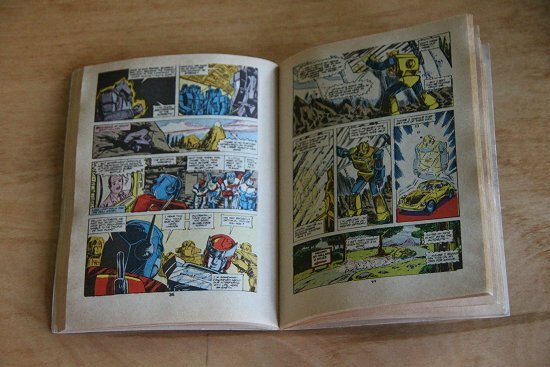 A beautiful Transformers comic book! I rarely find these and I've never found one in this format. 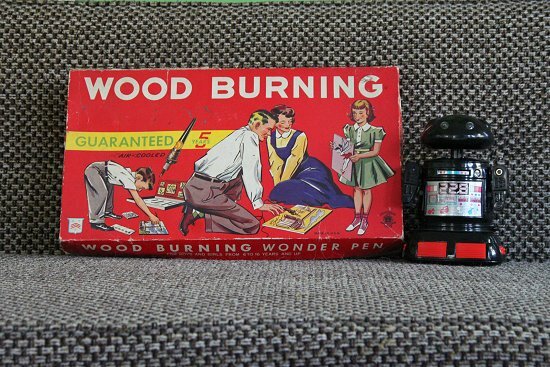 Another facinating find I wish I had more time to throughly document is this vintage wood burning kit. 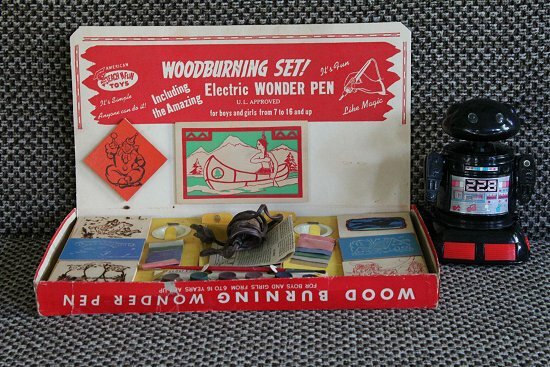 I'll have to break it out and play with the contents if I don't sell it first. 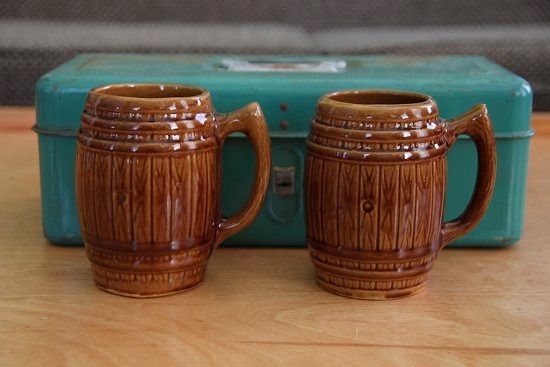 Painted wood burned pieces have so much extra dimension, definitely one of my favorites to collect. 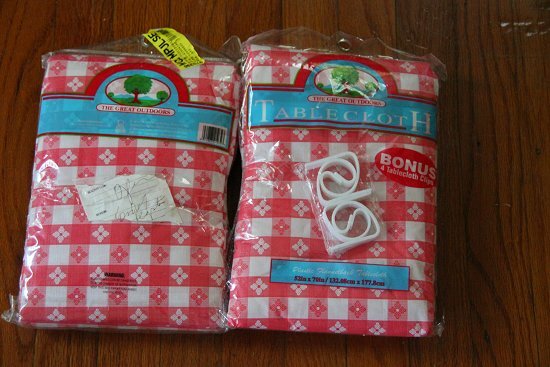 I'm going to use these to make picnic kits. Perhaps I'll use them on a picnic of my own, the weather has been perfect here in Florida! 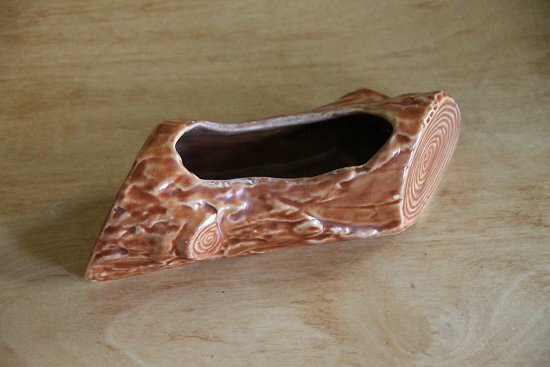 Beautiful log planter! I tried to resist it, but failed! I have some fun planting ideas for it. 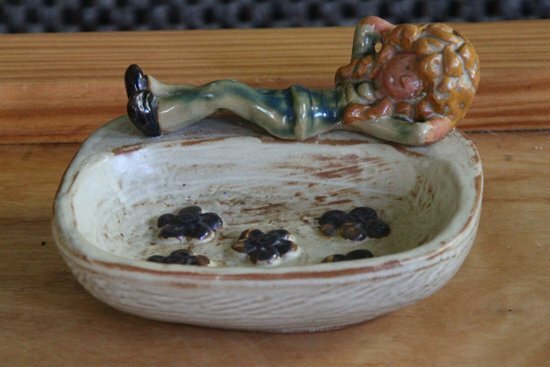 Vintage soap dish! The goofy girl and groovy flowers remind me of School House Rock. 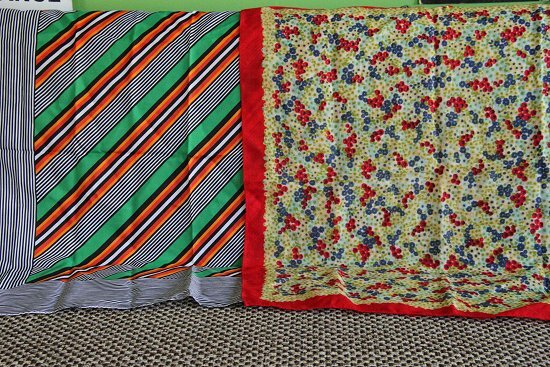 I rarely buy vintage scarves, but these two spoke to me somehow. They're cheap and easy to ship anyway, it was worth trying these out. 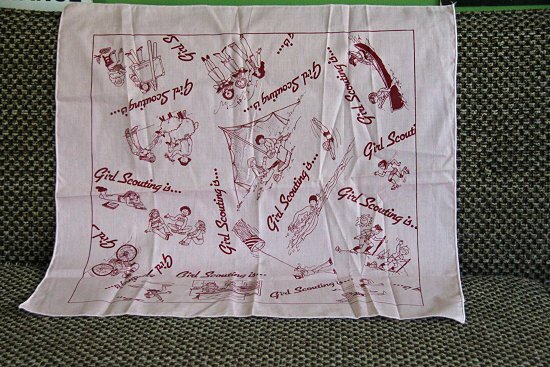 And this Girl Scout scarf was in perfect shape, I love the whimsical illustrations splayed across it. 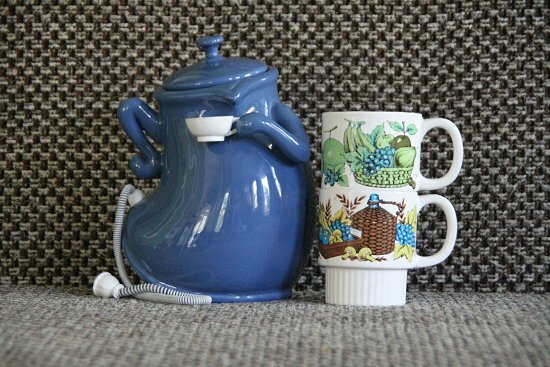 I loved the cartoony, novelty tea pot. It's not vintage and I'm not sure if it will sell, but I scooped it up anyway. 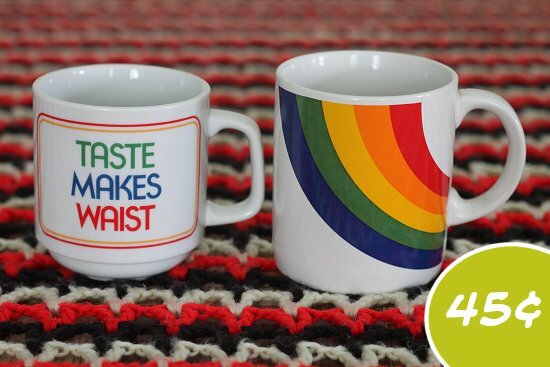 Loving the kitsch vintage cups, too. 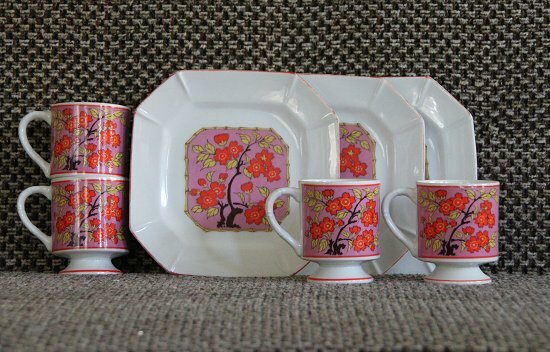 Beautiful, colorful cherry blossom cup set. I like how the handle is made to look like stalks of bamboo. Hurray, pop culture bits! I haven't even opened these up yet, but I can't wait to play the game. Hopefully all the pieces are intact. 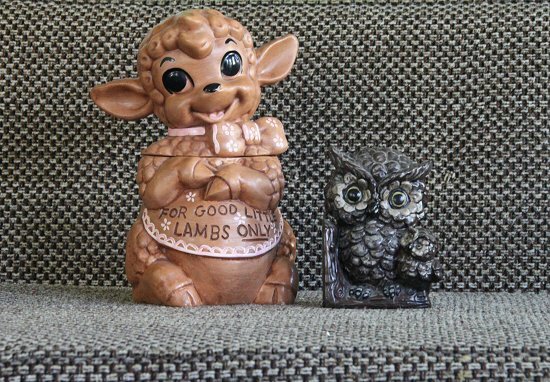 This huge lamb cookie jar is one of the cutest things I've ever purchased. I love how it's in such pristine shape! The owl bookend is adorable, too. And this just made me laugh. I affect this silly improper English at random with my friends. We're ridiculous. 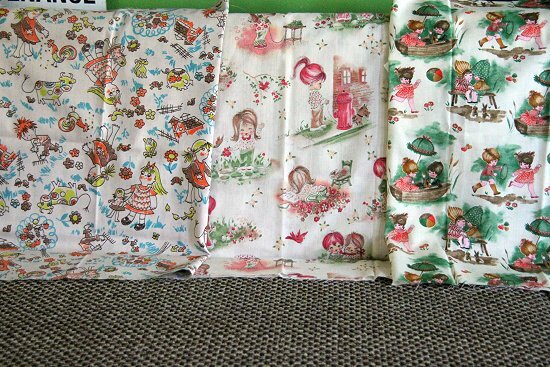 My mom found this super adorable vintage kiddie fabric. 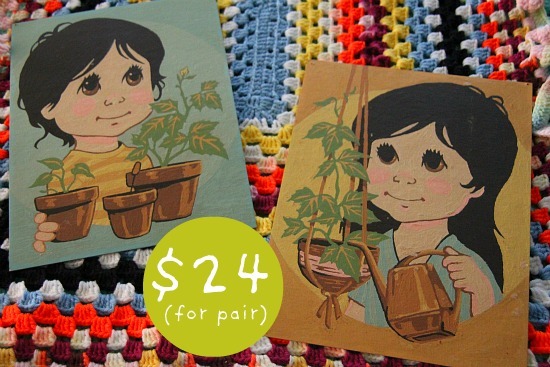 I think I'll try to sell these as is instead of sewing with them. 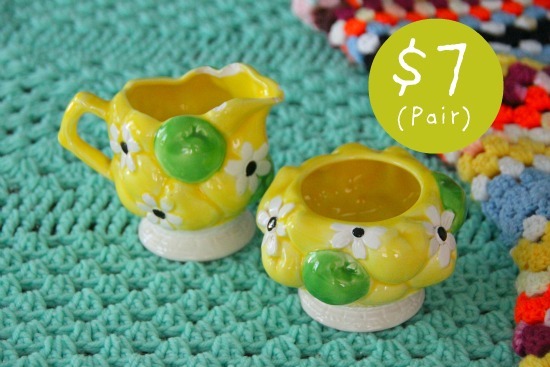 Yellow hippo planter! 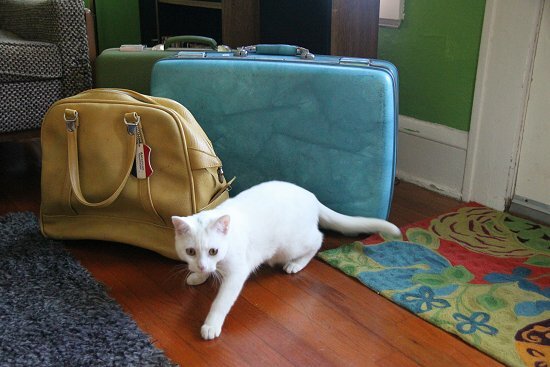 How can you not love him and his tiny vintage kitty companion? I sold my last coffee pot like this, so I thought I'd risk it again. My trivet fetish wouldn't let me pass up this one. I love the color scheme of bright, primary colors and the clean lines and shapes. 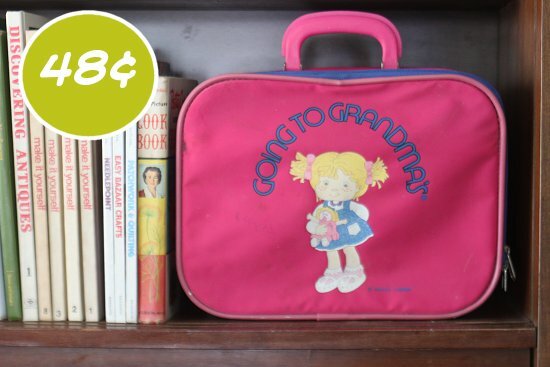 I love cute kid's stuff and couldn't leave this bit behind at the flea market. When I open shop there'll definitely have to be a little kid's section. 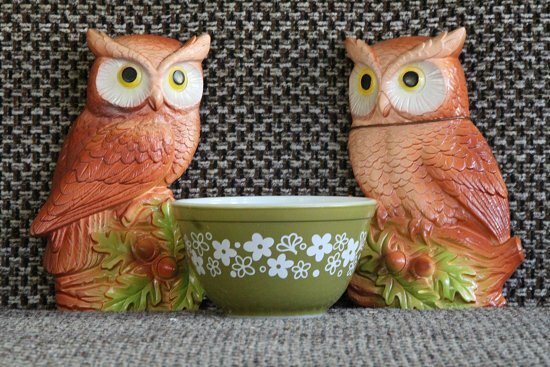 I was excited to find these chalkware owls! So damn cute. The flower print pyrex bowl was a fun find, too. 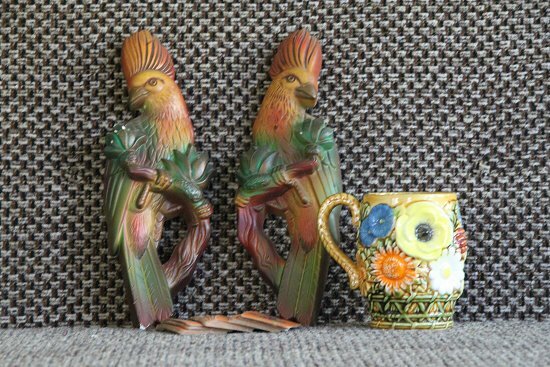 More chalkware birds, this time a pair of colorful cockatoos that would look nice with some cocktails...in a 50s mod tiki bar! 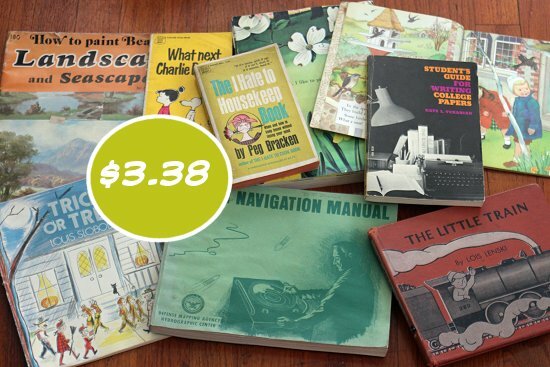 Vintage cookbooks! Yay! 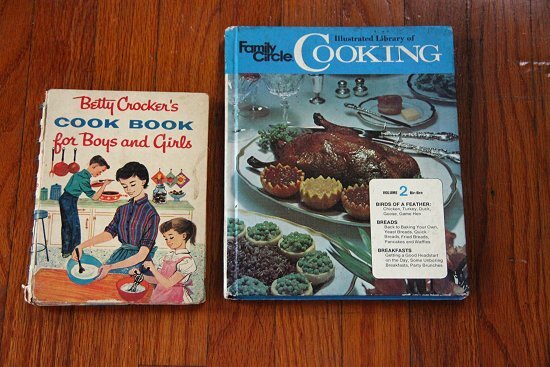 This is my second Betty Crocker for Kid's cookbook find, this edition is smaller than the normal version. I hear they're valuable to share, but both my books have a little damage. Hopefully I can still get a decent amount from them! 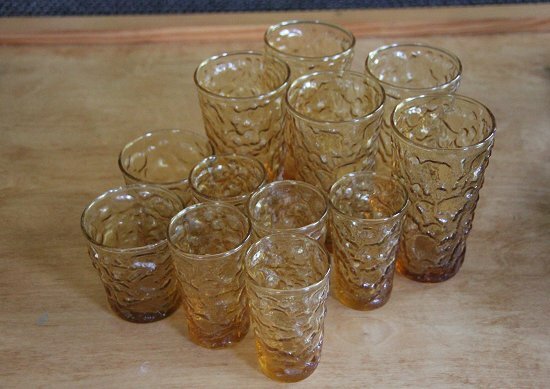 I used to own two green cups like the ones in this whole set. I'd love to ship it out to someone for a good deal since I got the whole set from such a low price. 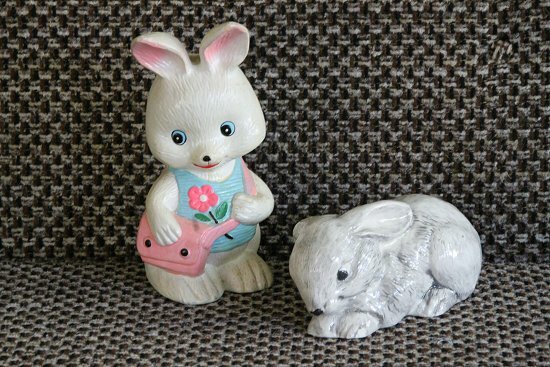 And bunnies for Easter! Why not? I'm a bunny fan anyway, no matter what time of year it is. 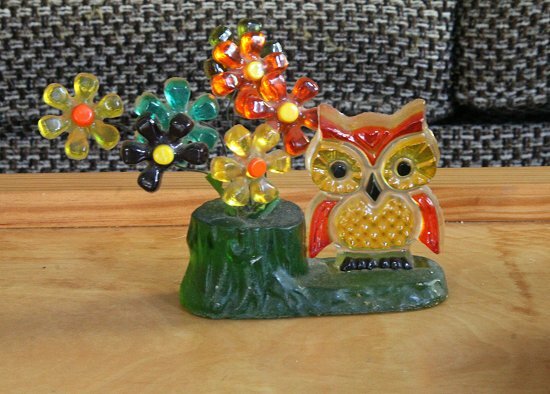 And another favorite find, this lovely colorful owl with matching flowers.